Editor’s Note: I’ve been sitting on my PAX report for a while after some delays (my brother getting married, life and work). I’ll visit it later; it hasn’t come out the way I want to. Earlier this week, Pro Player (and notably better Magic player than I) Paulo Vitor Damo de Rosa put out an article on ChannelFireball.com called “Everything That’s Wrong with Battle for Zendikar.” In it, he explains why he doesn’t like the philosophical direction that BFZ has gone and believes it’s a bad set. He came from the angle as a competitive player completely acknowledges that angle; that’s what I want when I read something from him. While I don’t fully agree with his position I want to take a look at this groundswell I’ve seen online about the hatred for BFZ. There has been a little bit of an issue with Channel Fireball moving his article around trying to hide it so it doesn’t effect sales of the new set in their store. I’m not looking to comment on this as I’ve had my own issues with a large online retail site/store before with their content. I’m all for an author writing what they believe without being tied to sponsors; that’s the major reason why I don’t have advertisements on this blog. If I write something like Paulo had and a sponsor didn’t like the content and this article might hurt sells, I might be pressured into writing something different or censoring myself. Paulo wants to start a conversation while giving his thoughts on the topic, and I fully applaud that even if I don’t agree with him. It’s taken me a while to warm up to several aspects of this set, most importantly the exile aspect of the Eldrazi. I’ve seen plenty of people want to use the Exile zone as another zone to play with (especially in player designs), and this is something I completely disagree with. Before Odyssey, the Graveyard was a zone where you almost never got cards back from it; now it’s seen as a second library in some decks. There needs to be a safety valve in a game where you can remove problem cards from play and Exile needs to be that zone. After talking with MaRo at PAX, he sold me on the Eldrazi exiling cards because he had the same issue. The Eldrazi, as you’ve seen, only play with opponent’s Exile zone. The point of them is that they mess with your opponent while you can’t abuse your own Exile zone in the process. As long as messing with the Exile zone doesn’t go further than this, I’m okay with the Eldrazi within this play space. Ghostfire Blade, Ugin, and Morph/Manifest/Megamorph. That’s right: the one (three) major mechanic from the last block is based on colorless creatures when they’re face down. Suddenly cards like Dominator Drone, Dust Stalker, Forerunner of Slaughter, Herald of Kozilek, Ruination Guide, Shrine of the Forsaken Gods, Tide Drifter, and Vile Aggregate can be placed in decks with Den Protector/Mastery of the Unseen. I’m not saying shove them all into a deck and you’ll win a PT, but it can be a starting place. 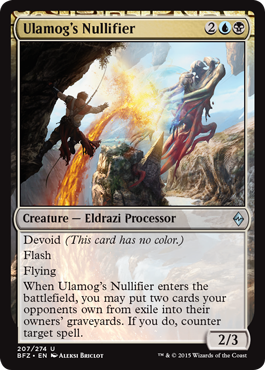 Theros was coming off the multicolor block of Return to Ravnica and Battle for Zendikar has almost the same number of mutlicolored cards (for this instance, it’s how to cast it instead of rules-wise about it being multicolored, only 14 are “true” multicolored cards). This isn’t a shift from Ravnica to Mirrodin where they’re at polar opposite ends of the spectrum, that’s something I expected to see from WotC pre-Onslaught when the next block wasn’t planned until work started on it. Paulo might be disappointed at the number of viable of multcolored cards in BFZ for competitive play, but it’s not for the lack of numbers. There’s a number of keywords in this set, but they can interact with keywords from the previous block. It’s not as cohesive, minus the face down cards which are colorless, but there’s still some crossing there. Creatures with Ingest might seem out of place without the Processors but they can help slow down your opponent’s Scry. But then if your opponent has Processors and you have a Delve deck, you want them to give you more cards to keep your graveyard filled. Paulo’s issue with Allies is something that I somewhat agree with, to a degree. There’s no nice visual cue about what is or isn’t an Ally and I think that was a huge mistake as well. I don’t think there needs to be an indicator on a card like the Miracle frames, but a visual clue like the Kicker ones from Invasion would’ve been cool (except less subtle). I read on MaRo’s blog where a reader suggested a watermark and that might be okay. Allies aren’t my favorite creature type, they rank above Slivers for me for my least liked. This time around Allies have more to do that just have enter the battlefield triggers and that’s what makes it more exciting. Sure, it’s a parasitic mechanic but there’s more variety with them this time. It’s like complaining that Dragons in Dragons of Tarkir were too parasitic since there were 3 total in Theros block (we’re looking at Standard, which is what PVDDR is talking about here). I’m sure we’ll get some more in Oath of the Gatewatch but like he said it should be about the here and now. I’m okay with this new creature type shift. The complaint of a lot going on in this set is a very valid one and I mostly agree. This seems like plenty of mechanics to fit into a large set. PVDDR says that Devoid and Awaken could be interchangeable save for the exile tacked on to the card. They are two separate keywords that do different things for the spell. Most of the spells in Magic that you see with a keyword can be replaced with another keyword and work fit just fine. This is just the first time in a while that we’ve seen it in a Standard environment; it can be easy to forget what Return to Ravnica brought to us with keywords. Devoid is a flavor/small gameplay style of keyword (it might change in OGW) while Awaken is gameplay/flavor keyword. Might the set have been better without them? I don’t know; Devoid seems like it can only go with the Eldrazi while Awaken makes sense in Zendikar because of the nature of the land. It seems like at the moment this is the only place to see the both of them used. The addition of Converge is an interesting one to me. It’s clearly a nod to the multicolor block before it but with the push of colorless it seems out of place. 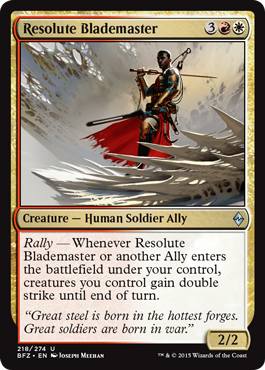 That is until you remember that Allies want to be in as many colors as possible and there are plenty of Devoid cards that are multicolored. Does Converge need to be in this set? I’d say no; it seems like an idea like Sunburst in Fifth Dawn where an artifact block was suddenly trying to get you to play as many colors as possible. This one I’ll chalk up to “Wait and see why this is here,” but it may be just too much like Inspired in Born of the Gods, just unnecessary. I can see where Paulo and other are coming from when it comes to looking at Battle for Zendikar. Is it my favorite set? No; I only see a couple pieces that interest my Johnny deck building. Of course that can all change when I sit down to play with the cards. The set looks fun to draft and I think it does have impact on other formats like Casual/Commander. There’s an easy complaint that WotC is focusing too much on Commander but this isn’t as bad as other ones I’ve seen. But looking at this set from a competitive angle like Paulo did, I can understand the disappointment. It might be a little sensationalist to say that it’s his least favorite set without playing it, and that’s all PVDDR is at fault here. Somebody reading my work for the first time must think I’m so fanboy who thinks WotC can do no harm. While I am a passionate fan I do see plenty of faults with WotC. Battle for Zendikar is far from a perfect set with multiple ideas and concepts going on at once especially with the most complex (design wise, not game wise) card I’ve seen printed in a long time in Ulamog’s Nulllifer. Looking at the angle Paulo did can give a very skewed perspective; but if you look at the 10,000 foot view, it’s much easier to see where all the pieces fit. The easy argument is to say, “this set is not for you, not everything is for you so wait for the next set.” If you believe the internet when a new set is released, it seems like this is the third year in a row where WotC is making sets that no one likes. While there was some truth in that for Born of the Gods and Journey into Nix, the Competitive Standard scene has always found new decks with the new sets being released. What I think one of the major issues that I see with this is that everyone wants to try and shove the new cards into already established deck archetypes but when a rotation hits it never works out that way. Magic is built on change. Having the same style/types of cards and the similar decks is boring and will lead to stale gameplay. Players should stop looking to repeat the past and should be exploring new areas. Of course, this is an over-simplified look at the situation and Battle for Zendikar in general. I’ve always believed in Einstein’s philosophy of to never stop questioning anything and that’s what PVDRR did here. It’s great to have different opinions and for the most part I have a different opinion of how Battle for Zendikar fits together than Paulo. 1) You mention that “colorless/gold” has happened before, but my beef regarding colorless is not with cards, it’s with lands. It’s perfectly valid to have colorless cards and gold cards in the same format – they are not excludent. Colorless LANDS, however, are pretty bad in multicolor formats; BFZ has EIGHT of those, on top of the good ones we already have. Devoid and Ingest do play with the old cards a bit (other morphs, exile), but I still think the mechanics are pretty self-contained – especially the ones that require multiple exiling, you can’t expect to cast two Abzan Charms to trigger them for example. Having self-contained mechanics is not necessarily a problem in itself, but I think it becomes a problem because a) there are so many and b) the set is weak. Take, for example, KTK – it was a multicolor block that followed a devotion block. Both strategies do not mash well together, but they are both strong enough to be competitive on their own. Now imagine that KTK is very weak – if that’s the case, then there’s no incentive to stop playing devotion, and no one would play the new gold cards. Ingest/Exile/Devoid are “the new gold cards” – they work together, but aren’t strong enough, so you end up not playing any of them. 2) I mention Awaken and Devoid being interchangeable because I feel like they’re both ways to have a ” “. Someone asked me what cards I liked from this set, my reply was “new hero’s downfall, new cancel, new end hostilities”, for example. Every card can be written as a function of a card that’s already existed – I feel like I’ve already seen everything. The landfall guys are the same with new numbers, allies are the same, converge is just sunburst, and then the spells are all identical because you have TWO mechanics that are just “add something to an existing card” – especially when that something means almost nothing, which is the case with devoid. I think one of them is fine, but I don’t think both should have been on a set that already has landfall, allies and sunburst. I hope I was able to shed some more light on what i was thinking of when I wrote the article! No problem. You wrote about an interesting topic and I had seen echoes of it within the Magic community and your article was a focal point with all of the concerns. 1) I had written a paragraph about the colorless lands but it didn’t flow right so it was left out. I’m perfectly okay with the Blighted lights as for flavor reason as the Eldrazi are “eating” the mana from the land. I like those designs. Sure, there’s the drawback of them only producing colorless but I felt that they were able to push what they were able to do because of the colorless mana. As for the other colorless land it looks like it helps ramp into the Eldrazi and not just for utility lands for other archetypes. We’ve seen powerful colorless lands before and if people want to play them they have to find a way. The mechanics aren’t as compatible with other blocks but I think they work well enough. I believe the Theros/Khans mechanics didn’t mesh all that well with each other. A cycle of rare enchantments and just more spells to target with Heroic? It didn’t really fit together with the mechanics; the cards that worked well between the blocks were the utility cards and ones that didn’t use the keyworded mechanics. The tug between the two blocks and need not to have the best decks be Block A deck vs Block B deck is a tough divide to cross. I don’t know how well this will play out but it does look better than the previous rotation. 2) I was sad that most of those new Awaken spells were old spells that we’ve seen in the past. I’m surprised that there wasn’t more exploration with Landfall as there was with Allies. With Core Sets gone, I would expect to see more “basic” spells as ones with the block mechanic attached (of course that’s been the case before but now it’s going to be much more noticeable). I believe in the philosophy of Magic design of “Everything is a Remix” which is were some of these mechanics come into play (Converge). At the moment I think of Devoid as trinket text until there’s a metagame reason why we should care about cards being colorless. Players were expecting Landfall and Allies back when we returned to Zendikar so those were inclusions to the set. Converge might be a lost mechanic save Bring Into Light. I do see this as a set with maybe too much put into it. With this being the first set in a new block design paradigm, I need to see how the second one comes out so see how WotC is handling this. Allies in this set are only parasitic on the surface. When you read the card, they all just say when they (or other allies) enter, your entire army gets *something. * Thus, if you don’t mind getting the effect once (like the Lifelink one, which I am thinking of purging in my cube with the only “ally” support being Mirror Entity and Chameleon Colossus) then they’re great, they’re basically a sorcery with a body attached. After playing around ten drafts the format is already worn out. It’s completely imbalanced. Ally and Landfall are abilities that read “Your creatures are better on your turn and can’t block well”. Rally is a temporary, recurring soulbond for your team. RW is a miserable matchup for both sides of the table. It is the exact same archetype as GTC, THS, AVR, and ZEN, drop creatures and tap to win. Devoid, Ingest, Ally, Converge, and even Awaken feel randomly scattered on cards that pre-existed the set, just add abilities until it feels Zendikar. Bad design. While one deck wants to curve out and play tricks, other decks have removal that is all sorcery speed and insanely overcosted, so tricks are still entirely too powerful in the right opening hand. The red first strike instant is particularly annoying, because you can have a trick of your own that costs more but gets trumped by a chump card. Lifegain is an awful mechanic to have smattered across a set, especially a racing set such as this one. There is so much lifegain it makes me sick, and they put it in the colors with the best early drops, removal, and evasion. And it is a racing set. I haven’t seen a game where the player on the play had a two and three drop and didn’t have an almost unassailable lead. Speaking of evasion, everyone says flying is better than expected. That’s because it’s harder than ever to interact with flyers, and there are very few to go around. Bad design. The big bads don’t show up. Not even the true eldrazi titans, the big rares and uncommons are almost to completely unplayable. They’re too vanilla to justify playing, especially when more than one in an opening hand is all but a free Hymn to Tourach. And the little Eldrazi? They exist not to cast bigger Eldrazi, but to get pumped by Tajuru Warcaller and her ilk. For all of the talk of synergy I’ve only found that’s because certain cards say “play me in this specific deck or I straight up do nothing”. Most decks still play all good cards.dec with rare and uncommon early gets defining the flow of draft. A deck can easily be made in any pairing that has all of the mechanics, and none of them feel different for having gone all in, save that the lifegain deck goes from pretty good to a pain in the neck. All over you get the sense that the designers wanted a slower format, but they filled it with midrangey/aggro mechanics and three power 2 drops. It’s a mess in limited. It’s a mess for constructed. It’s widely unpopular. They crossed a line by printing the expeditions in order to sell a dud. You Sir, are polishing a turd.